Present Illness: A 68 year old man is seen in the clinic for swallowing difficulty of 10 years' duration. Over the past three years, he has noticed that his swallowing has become more problematic, affecting ingestion of solids more than liquids. He also states that his eyelids have always been "closing," and he had bilateral blepharoplasties for this problem approximately six years ago. Blepharoplasty was repeated in the right eye four years ago. Occasionally, he has experienced mild diplopia, more notable in the evening or when fatigued, and not readily recovering with brief rest. Aside from these difficulties, he reports no muscle weakness in the arms or legs, either proximally or distally. He has not noted any problems with walking, or with his usual daily activities. He denies any muscle pain or soreness, joint pain, or skin rash. Blepharoplasty on the right eye six and four years ago, and on the left eye six years ago. Medications: Atenolol 50 mg b.i.d. ; Clopidogrel 75 mg q.d. ; Aspirin 325 mg q.d. ; Atorvastatin 40 mg q.d. ; Trandolapril 4 mg q.d. ; Fish oil supplements, daily. Social History: He denies tobacco use, but enjoys moderate alcohol use. He is a retired real estate agent. Family History: His father, two brothers, and one sister all had problems with eyelid drooping. His brothers both had difficulty swallowing. The family is of French-Canadian background, with the patient's paternal great grandparents resettling in the state of Maine after emigrating from Canada. Review of Systems: He denies any fevers, chills, and nausea or weight loss. He does not have any problems with breathing, either with exertion or while supine. He denies diarrhea or constipation. He denies bowel or bladder incontinence. General: The patient is a well dressed, well nourished male, appearing his stated age, and in no acute distress. Vital Signs: Pulse 52/min., respirations 18/min., blood pressure 123/72 mmHg, weight 191.8 lbs. HEENT: Normocephalic, no evidence of trauma. Sclerae were anicteric; nares and oropharynx were clear, with moist mucous membranes. Neck: Supple, with no lymphadenopathy, thyromegaly or carotid bruits. Abdomen: Soft, non tender to palpation; no masses or hepatosplenomegaly felt. Mental Status: Alert and conversant, with intact language and appropriate thought content. II Visual fields were full to confrontation. Pupils were equal, round and reactive to light. Funduscopic exam was normal. III / IV / VI There was minimal subjective diplopia on lateral gaze, which did not change with sustained gaze. There is no restriction of eye movement. The patient has notable bilateral ptosis, which remains fixed with sustained upward gaze. V Facial sensation was intact to light touch, temperature, and pinprick. Corneal reflexes were intact bilaterally. Strength in the masseters and temporalis muscles was intact. VII The patient's eyebrows and frontalis muscles were elevated symmetrically. Facial motor strength and expression were full. VIII Hearing was intact to finger rubbing bilaterally. IX / X Palatal elevation was symmetric, and the uvula midline. Gag reflex was intact. The patient could swallow 6 oz. of tap water from a cup without pausing or clearing his throat. XI Sternocleidomastoid strength was 5/5 bilaterally. Motor: Spastic tone was not appreciated. Strength was 5/5 in the right deltoid and 4+/5 in the left deltoid. Biceps strength was 5/5 on the right and 5/5 on the left. Triceps strength was 5/5 bilaterally. Wrist extensor strength was 5/5 on the right and 5/5 on the left. Strength of wrist flexors, finger extensors, and finger flexors was 5/5 bilaterally. Hip flexor strength was 4+/5 bilaterally. Strength of the remaining muscles of the lower extremity strength was 5/5. 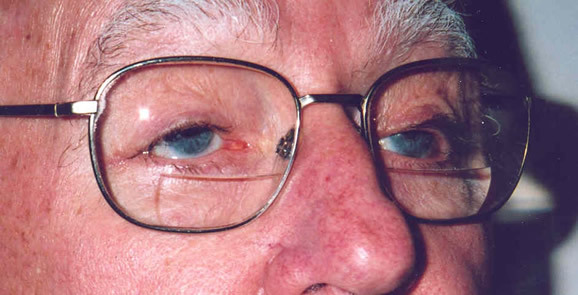 The patient did not show fatigability with repetitive contractions of the deltoids against resistance; neither did his ptosis appear to worsen after giving effort in the limb muscles. Reflexes: Tendon reflexes were 2+/4, brisk and symmetric at the biceps, triceps, brachioradialis, patella, and Achilles. The patient did have minimal crossed adduction at the knees, symmetrically. There was no delayed relaxation after reflex contraction of the muscles. Babinski response was flexor bilaterally. Hoffman signs were absent. Sensation: Sensation was intact throughout to tests of light touch, pinprick, vibration, proprioception, and temperature. Coordination: Normal finger to nose, rapid alternating movement, and heel to shin maneuvers were performed bilaterally. Gait: He was able to walk on his heels and toes. Tandem gait was performed without difficulty.